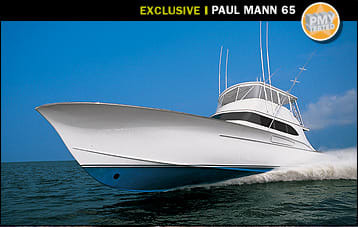 At first the detail seemed of little import: two ten-inch-long stainless steel rods that were bored-out, flush-fit, and passed through the seamless teak covering boards to port and starboard on the Paul Mann 65. These one-off custom rods allow the line securing the optional 41-foot Rupp outriggers to pass through the covering boards and locked down via a clam cleat underneath. No bulky above-board hardware. Inconsequential? 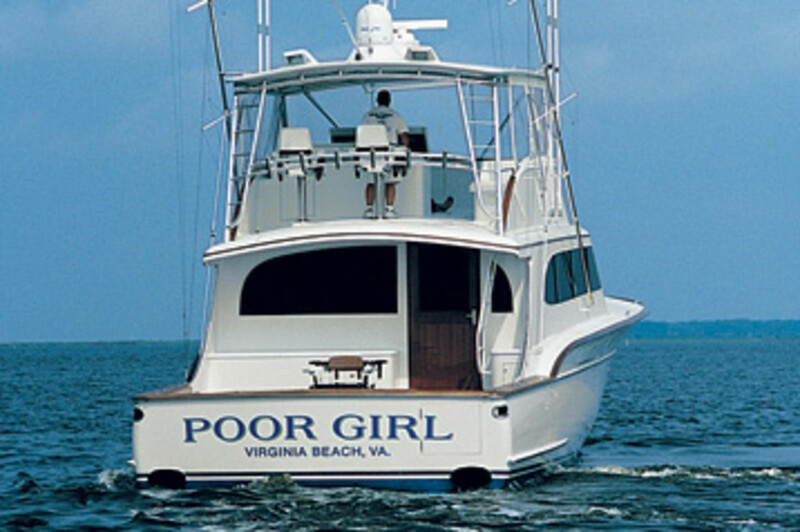 Not to Virginians Jack and Marilyn O&apos;Donnell, for it was artisanal elements like this that led them to choose custom boatbuilder Paul Mann to construct their—and the builder&apos;s—largest sportfisherman to date. 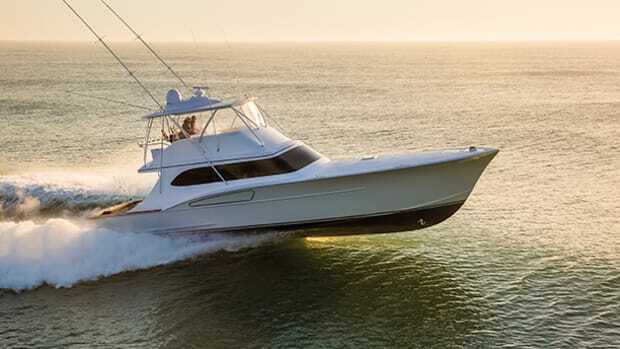 Indeed, the 65&apos;s clean look is the result of owner input, two-plus decades of Mann&apos;s boatbuilding experience, and life-size mock-ups of almost all of the boat&apos;s features. 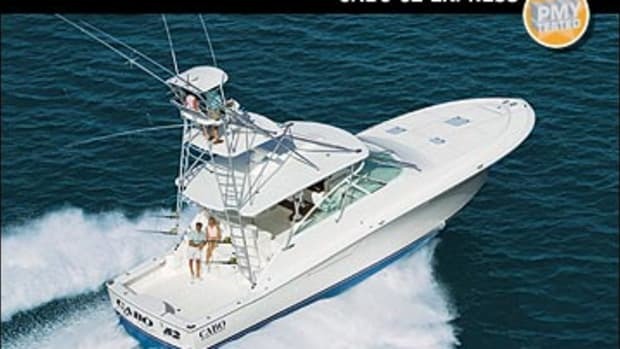 "We chartered boats for 18 years," Jack says, recounting his ownership of a charter-fishing business that included in its fleet a 44-foot Ricky Scarborough and a 54-foot Paul Mann. 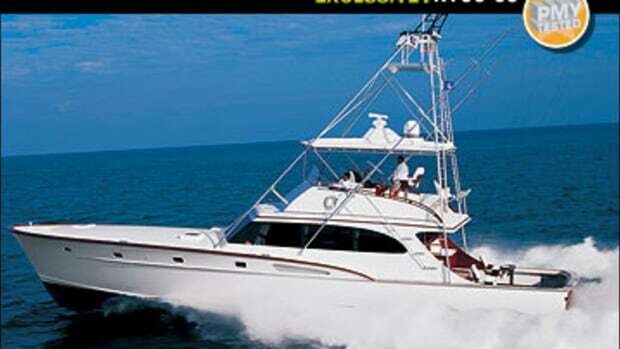 "The idea was to charter this one, &apos;til we got it. I sold the charter business—the whole shootin&apos; match," he adds with a wide smile. The O&apos;Donnells plan to fish their 65 for pleasure only and do some cruising, and as you can see from the outrigger setup, they knew how they wanted their boat rigged. Where those stainless steel rods leave off, the expanse and cleanliness of the all-teak cockpit begin. Because it has a mezzanine measuring 8&apos;x2&apos;x1&apos;5" and houses stainless steel bait freezers, a cooler, and an ice maker, the sole is a solid, hatchless structure. 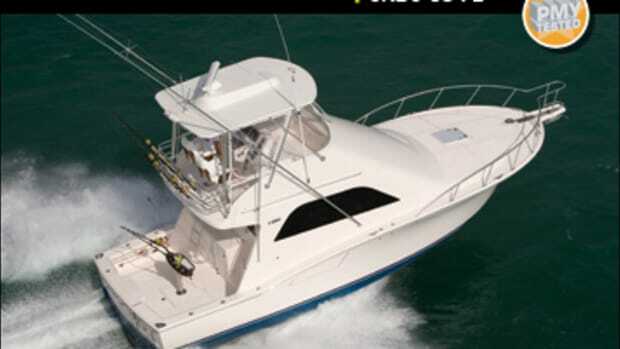 There&apos;s no in-deck livewell or fishbox; they&apos;re built into the transom and constructed of stainless steel. 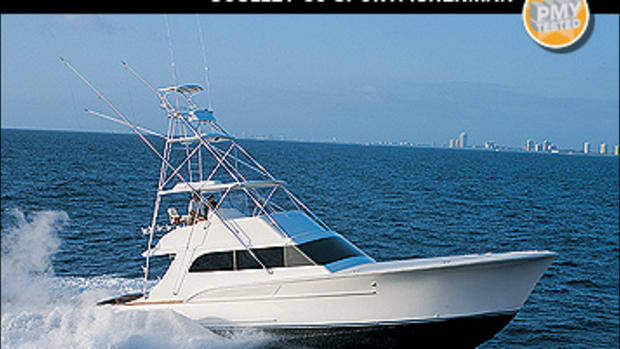 The unobstructed 196-square-foot cockpit was a beauteous sight to me as an angler, especially bathed in the glow of freshly oiled teak. But the uninterrupted (except for the optional Release fighting chair) cut serves another purpose: Without a large deck hatch over the lazarette (which is accessed via a small companionway from the engine room), there&apos;s no chance for water to drip down, keeping the area dry as a bone and clean as a whistle. Leaving the cockpit to explore the engine room, which is home to two 1,400-hp Caterpillar 3412E diesels, I measured a comfortable 61 inches (I&apos;m 5&apos;7") of headroom and nearly 26 inches of space outboard of the engines. I did have to crawl over the mounted Craftsman toolbox to access the outboard portion of the starboard Cat, but you do need tools onboard. All regular maintenance points are easily accessed, and the space was, like the rest of the boat, neatly arranged and spotless. Take that mezzanine, for example. A full-size mock-up helped the owners envision the finished product, and although Mann told me he wished he&apos;d built it a hair lower—my feet dangled off its lounge—the owners told me they love it. In fact, Marilyn spent some quality time here during my day onboard, and it provides a great view of baits and battles without being in the way of the action. A flying-bridge helm mock-up proved quite useful to Jack, too. Everything from the height of the single-lever Mathers controls to the of the wheel angle to the placement of the trim-tab switch under the teak helm pod was designed to accommodate his frame. (Jack is about six inches taller than me.) That&apos;s why I had trouble reaching the tab switches and keeping clean sightlines forward when I ran the 65. That&apos;s custom for you. 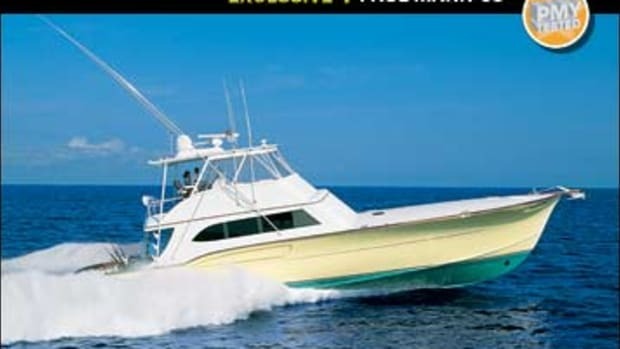 One sweet angling feature I found while I was on the flying bridge is the cutback hardtop. 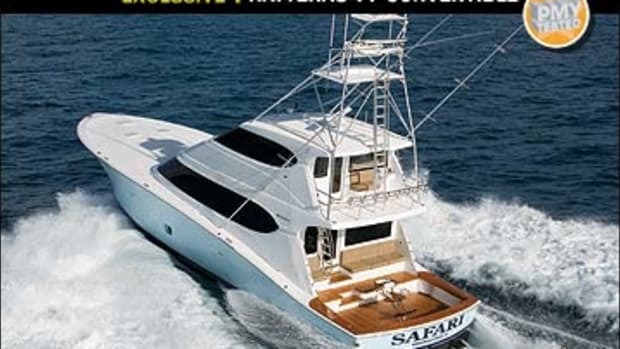 The O&apos;Donnells&apos; son, Sean, explained that if Jack wants to hook a fish from a rod in one of the rocket launchers mounted at the back of the flying bridge, he doesn&apos;t have to worry about whacking the hardtop. "He&apos;s got clearance," Sean says, as he illustrates a hook-set. The helm area may have been built for Jack, but some of the other 65&apos;s features were definitely built for Marilyn, especially below decks. Take the amidships master. The couple wanted a vanity at one corner of the queen-size berth. Mann had Marilyn sit on the edge of the berth and then built the vanity to suit her height. Marilyn told me she also wanted the sinks in the two full heads below decks to sit a few inches higher than standard sinks so the couple wouldn&apos;t have to strain their backs when bending over to use them. 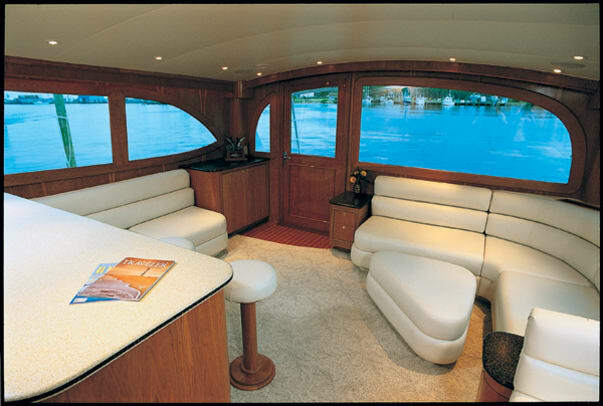 She also worked with Mann&apos;s interior designer, Dennis Scott, to help marry the light- and dark-accented Avonite countertops (a theme which runs throughout the 65), the high-gloss cherry-and-maple soles in the galley and heads, and satin-finish, grain-matched cherry interior. Marilyn says she&apos;s still tweaking the interior. "[Originally] we wanted something tropical, nothing fancy. We&apos;re still working on it. We want something that&apos;s classy-casual," she adds, as she looks around the saloon doing a mental mock-up. One thing&apos;s for sure: The O&apos;Donnells truly had fun building Poor Girl. "I look at this boat and go ahh," says Marilyn, grinning like a Cheshire cat. "When you&apos;re building a custom boat, everything&apos;s a decision. It was a very enjoyable process," Jack says, just before starting his boat&apos;s powerplants. It was time to see the fruits of this owner-builder collaboration in action. The late-July day was getting hot, and I noticed the flags at the marina were stiff. The wind was blowing south-southwest between 20 and 25 knots. Jack ran his boat with confidence and ease during our speed runs, and the 65 averaged 42.4 mph (37 knots) without tabs in the short-spaced, four- to five-footers in the Atlantic. 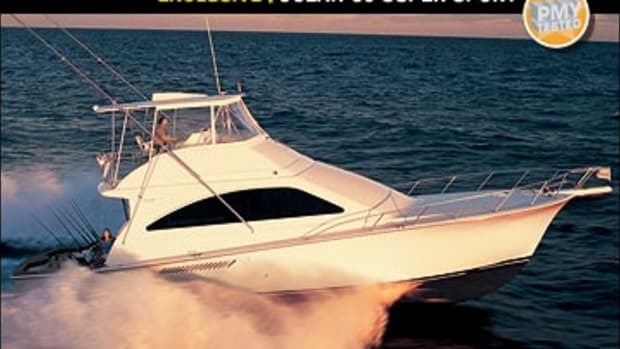 When he tabbed her down, she made 43.7 mph (38 knots). A few moments after retiring my radar gun, Jack handed me the wheel. "You can push her harder than that!" a confident Mann bellowed as I ran the 65 headlong into the waves. The ocean was frothy enough to show what this boat could do in a seaway. 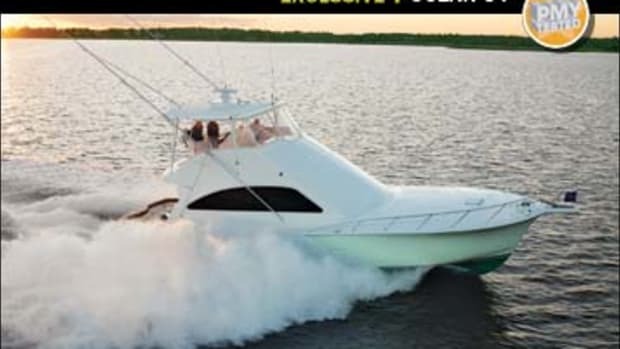 I firewalled the Mathers controls and took advantage of her silky-smooth Hynautic power-assist steering to get her bow head-on with the whitecaps. Whether I ran her this way, stern-to, or in the trough, she took it all and dished it back without so much as a smack on a chine. The 65 offers one solid ride. How solid? Right around WOT, I realized the other seven people on the flying bridge around me were talking like we were bellied up for cocktails at Rudee&apos;s on the Inlet Bar, a local watering hole. Nobody realized (or cared) that we were traveling in any sort of slop or that the 65 was making 43-plus mph. No one noted any spray, compliments of an aggressive flare. No one felt the boat roll (&apos;cause she didn&apos;t). No one had a care in the world; they were just enjoying a boat ride. Mann was smiling, and I could tell he expected nothing less. "She&apos;ll eat this up all day," he says like a proud papa, smiling with arms crossed. And so did the O&apos;Donnells. As Jack said to me when I finished my wheel time, "Too bad we ran late, Patrick, we really wanted to run off and do some fishing." You can bet we won&apos;t run late next time, Jack.